Battle Creek, Michigan – September 8, 2015 – Wee-Woo the domestic Toulouse goose was born into a life of tragedy. His goose family had been illegally abandoned at a city park in Ypsilanti, Michigan. Day to day survival depended on a few kind individuals dumping junk food in the parking lot for the family to eat. The flock had to compete with predators, namely the human kind, who left fishing line, hooks and other improperly disposed of wastes littered in what was their "home." Seeing flock members with hooks embedded in their legs and fishing line entangled around their wings and legs was a reality Wee-Woo saw, but he had no choice. Despite being born in the wild, he, like his family were domestic farmed birds, incapable of true flight and with few survival skills. They had no choice but to call the river home, and the parking lot garbage was their diner. Wee-Woo was baited to the scene of his tragedy. 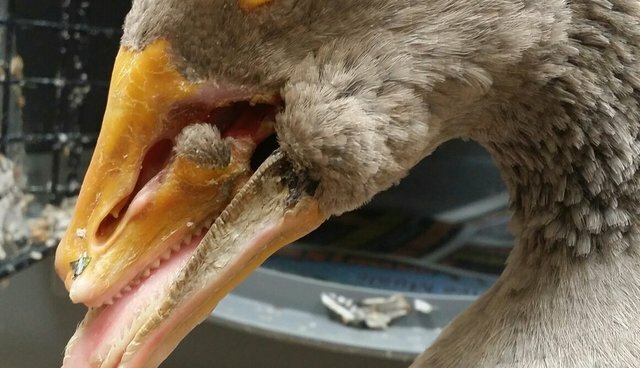 A firecracker was reportedly placed into his pile of food, and part of his face, and beak, were blown off. Wee-Woo was starving, and couldn't pass up a free meal. Recall, these birds were illegally abandoned and left to fend for themselves, at-risk to malicious, violent criminals looking for easy victims. The remaining members of the flock are now seeking permanent, loving Sanctuary through All Species Kinship. How could this bird survive? His family segregated him from the flock, a natural instinct for their own protection. He stood alone, to the side, ostracized, but he stayed standing. He did not give up. He had a will to survive. All Species Kinship, a 501(c)(3) nonprofit operating a domestic bird sanctuary, was called to his rescue and we promised Woo: we will do whatever we can to restore your health and give you a chance to be the bird you deserve to be. Wee-Woo's journey to recovery has begun. He recently traveled all the way from Michigan to our avian specialists in Minnesota for evaluation, and he needs an estimated $1,000 worth of surgery. We are asking for an additional $500 to help offset gas and lodging costs. It's not cosmetic beak repair, it's life-saving surgery to restore the tissues that were blown away in the region of his cheek. The cavity that was created there from the explosion is at-risk of constant infection-as it is connected to his sinuses. Wee-Woo may need additional surgeries, but our first priority is to get his face healed so that the risk of chronic infection is gone. He is not currently exhibiting any signs of pain and feeds himself, but cannot live outside due to risks of infection and maggot infestation. The chronic illegal abandonment of farmed birds is a story that needs to be told, and an issue that A.S.K. tackles throughout the year in communities throughout Michigan. Providing rescue services and Sanctuary is not enough--these birds are individuals with stories to tell.